Cilantro is actually the leaves of the herb Coriandum Sativum . The seeds are generally known as Coriander. This delicate fern-like plant with pinkish white flowers and aromatic seeds will tempt your palate with a delicious mix of parsley and citrus flavor. Seeds can be crushed to be used as seasoning for almost anything ranging from soups to pastries and salsas. 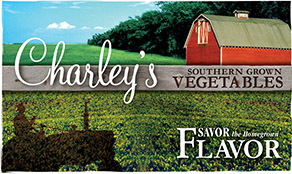 Young leaves can be used in salads, soups, poultry dishes, or a variety of other dishes. Cilantro is a short crop because of its tendency to bolt when it gets warm. When harvesting, cut from different sides of the plant each time. By the time you get back to where you started, new leaves should have appeared. Keeping the plant pruned should help prolong the crop. If you want Corriander, then let the plant go to seed. You can harvest the flowers once the seed is set and hang them upside down in a paper bag in a warm, dry place. When they are dry just shake them into the bag and store in an airtight container. You can also let them dry on the plant and then shake them into a container. Spacing: Plant 8” to 9” apart. Height: Grows 12″ to 24″ tall. Outstanding Features: Coriander has been used to treat digestive ailments and colic. Tips: Staking the stems of this plant will help it from bending or breaking. 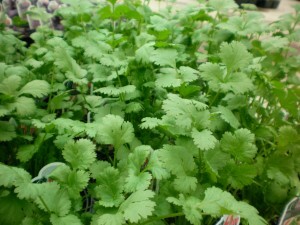 Or click here to buy Cilantro direct from www.buygardenvegetables.com.